LAWRENCEVILLE, N.J., August 18, 2018 – Café Du Pain Bakery, a new artisanal bakery has just held its soft opening at its flagship location with a heartwarming response from friends, family and community members and special appearances from the Mayor of Lawrenceville Christopher Bobbitt and Councilman James S. Kownacki. Café Du Pain Bakery is located in the Lawrence Shopping Center in Lawrenceville, New Jersey (2495 Brunswick Pike, Unit 12). “I took a trip to France today – without the security screening. I visited Café Du Pain in the Lawrence Shopping Center. 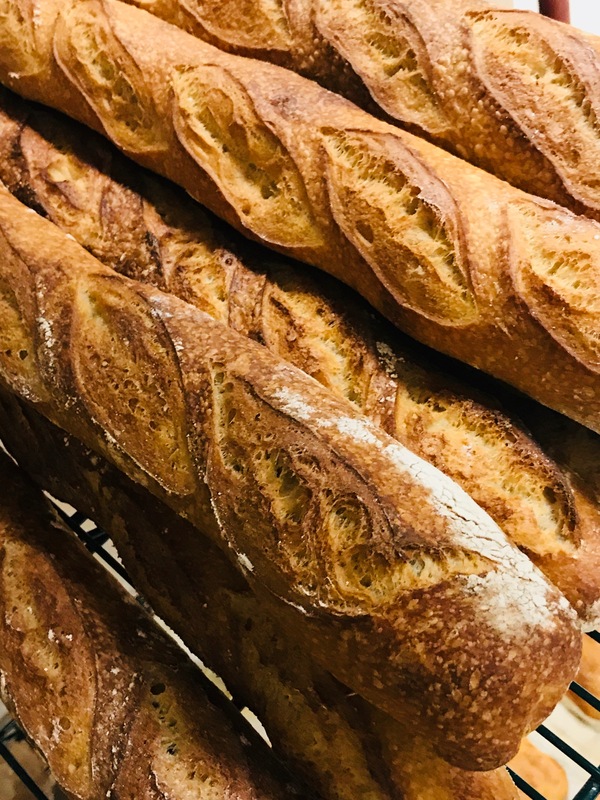 The baguette & coffee were wonderful!” said customer Standley Wilk Jr.
Café Du Pain Bakery’s treats are inspired by global culture, travels and experiences. Baking and the ingredients used for baking have always come from many cultures. Building on the historical tradition of baking, the bakery incorporates the influence of Africa, Asia the Caribbean, Europe and the United States, including typical bakery fare and new breads and pastries that are sure to become local favorites. Café Du Pain Bakery’s fresh-baked goods, along with the specialty coffee, offer a feast for all the senses. Ingredients and spices from Madagascar vanilla, Vietnamese cinnamon, Midwestern wheat flour and Caribbean coconut are all mixed in different ways to create a number of delicious goodies baked daily on premise in Lawrenceville. The power of food brings people together and builds communities. Our mission is to connect people to a more delicious world through our globally inspired baked goods. “The power of food brings people together and builds communities. Our mission is to connect people to a more delicious world through our globally inspired baked goods,” says Marie Onyeani, founder/chief chef and baker. “Our food is made from delicious, wholesome, intentionally sourced ingredients. We are creating delicious baked goods because we want to transport our customers through a delicious and authentic food experience, whether they are commuters, shoppers or neighbors.” Café Du Bakery is committed to its customers through quality products with extraordinary customer service: delicious baked goods matched with a delicious experience all around. Café Du Pain Bakery has gained tremendous support from the community with customers leaving five-star ratings and recommendations on Facebook and loving photos of blueberry scones, banana walnut muffins and oatmeal raisin cookies on Instagram. The bakery will launch a “Birthday Wishes Program,” where they will create and offer a special monthly birthday cake to children impacted by homelessness as part of their community initiatives. Café Du Pain Bakery offers classic French patisseries, croissants and baguettes; a special Lawrence Sourdough; Caribbean coconut cake and Haitian/Kreyòl Patties. Sourdough takes on the flavors of its surroundings, so the Lawrence Sourdough truly is unique to the community. The chocolate croissants, butter croissants and baguettes have sold out on each of the days the bakery has been open. The bakery offers a wide variety of breakfast pastries, breads, artisanal sandwiches and sweet treats; there is something for everyone. Offerings are introduced on a rolling basis throughout the month of August to allow customers to savor the goodness and satisfy their cravings during this first month of opening and to finalize a core menu based on customers' taste and desires. The goal is to produce baked goods that customers want and love. Gourmet specialty coffee from La Colombe is brewed fresh throughout the day. Great pastries and breads must be paired with great coffee drinks for a meaningful culinary experience. In addition to a core menu, seasonal items will celebrate holidays and cultures and will rotate based on guest feedback and the baker’s pick of the day and week. Long-time baker and food enthusiast Marie Onyeani grew up in Trenton. A graduate of Rider University, Onyeani started her career as a teacher in the New Jersey public school system before deciding to focus full time on her passion for baking 10 years ago. One of Marie’s advisors, J. Registre, is an international impact investor and equity expert whose love and passion for extraordinary pastries and gourmet coffee brings her to this venture. An official grand opening is being planned for fall. Be sure to follow Café Du Pain Bakery on social media for updates.